Take the 7 train to the end of the line, and you’ll feel like you’ve stepped into not just another borough, but another country entirely. I always head to Flushing when I want amazing food, sights and cultural experiences. Manhattan may have the oldest Chinatown in the five boroughs, but Queens surely has the best. 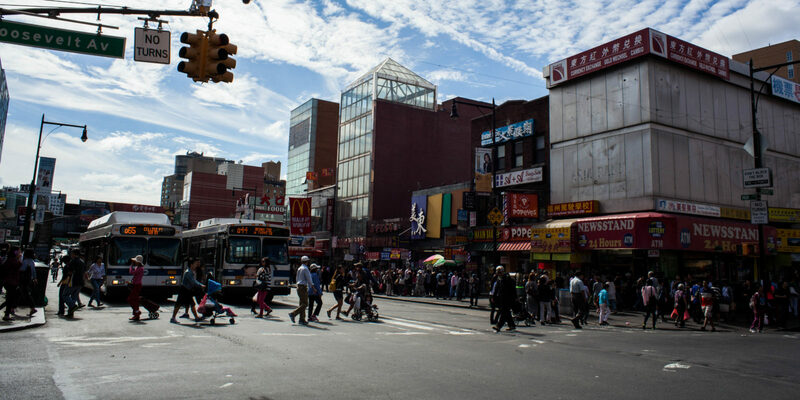 Flushing has been home to immigrant and refugee populations since the first Dutch settlers moved there in the 1600s, but a surge of Asian immigrants in the late 20th century turned it into the multicultural metropolis it is today. When you exit the subway, you’re deposited onto Flushing’s bustling Main Street, jostling for sidewalk space with street vendors, overflowing fruit stands and locals pushing granny carts full of groceries. Nearly every sign is in Mandarin, and it can be intimidating at first glance. 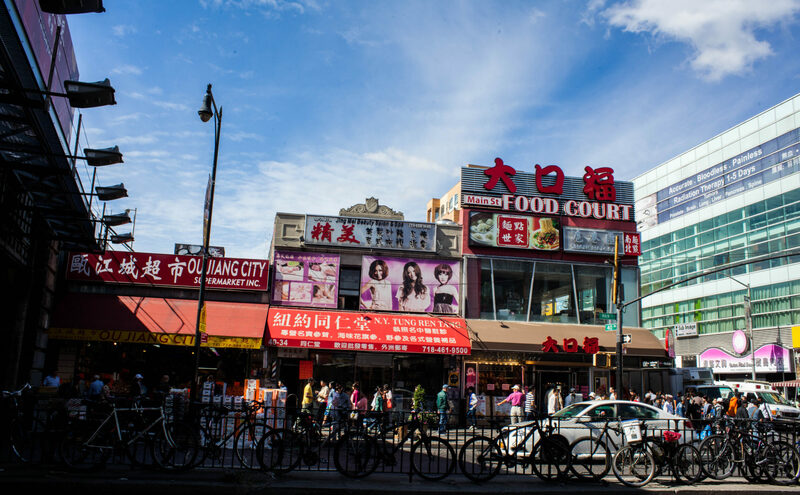 But for the adventurous traveler, exploring Flushing’s restaurants and food courts is an unforgettably unique New York experience. Both Hunan Café and Guan Fu are a little off of the main drag, and that’s enough to give these restaurants a more serene setting. For a feast fit for an emperor — in equally sumptuous surroundings — settle in at the Hunan Café. The menu is lengthy, but I always choose the beef with crispy pepper and cumin lamb. The first dish has a slight kick, while the second is deliciously sweet. Both come in generous portions, so you might want to share. For a little more spice, head over to Guan Fu, a relatively new Szechuan restaurant that received three stars from the New York Times last summer. While pretty much every dish packs a punch, some, like the fried frog with Sichuan pickled pepper, will leave you crying for mercy. Give your taste buds a break with the delicious fried cabbage and squid in hot stone pot. Or sample the boiled fish with pickled cabbage and chile to try a truly unique flavor. For dim sum aficionados, the banquet-hall-sized Asian Jewels restaurant will be worth the wait on a weekend morning. 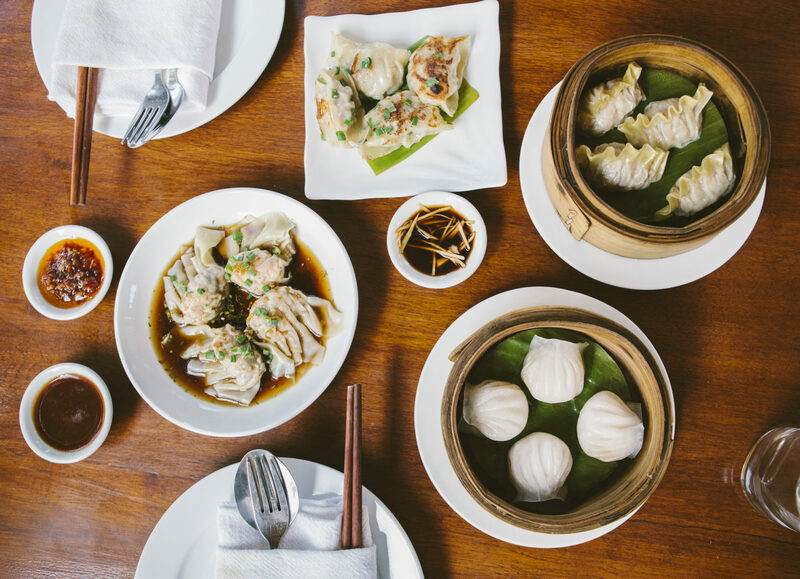 Waiters push carts filled with reliable favorites like shrimp crepes and pork buns, as well as more adventurous options like chicken’s feet and pig’s ear, and none of the small plates will set you back more than a few dollars. Elsewhere, Spicy and Tasty is an old standby that’s been a mainstay of the neighborhood for more than a decade. You’ll find crowd-pleasing Szechuan favorites like the zingy cold jelly Chengdu style (noodles infused with red chili oil, Sichuan pepper, minced garlic, scallions, soy sauce and vinegar), smoked tea duck and dan-dan noodles with minced pork. Fu Ran specializes in the northern Chinese cuisine from Dongbei, but I really go there for one thing: the decadently delicious Muslim Lamb Chop. The dish is first braised until the ribs are fall-off-the-bone tender, then fried, then buried in a flavorful blanket of cumin seeds. Dumpling Galaxy in the Arcadia Mall really only makes one dish, but the combinations are nearly endless. 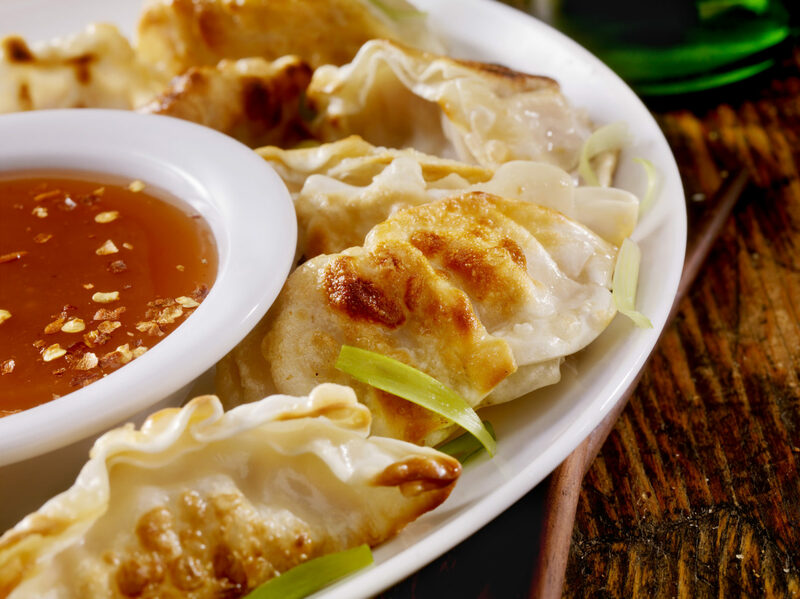 While you can order any dumpling fried or steamed, the latter really shines. The lamb-with-green-squash dumplings are a revelation, but you can’t go wrong with any of the nearly 100 combinations on the menu, like duck and mushroom, dried octopus with chives and pumpkin with black sesame for dessert. To maximize your culinary choices, wander into one of the bustling mall food courts in Flushing. These food courts are not so different from those in your local shopping center — that is, if your local shopping center offered squids on a skewer instead of hot dogs on a stick. Create your own sampler with dishes from various stands. I suggest trying the pork, shrimp, sea cucumber, cabbage and crab meat dumplings from Chinese-Korean Dumplings and Noodles at New World Mall, or enjoy hand-cut lamb noodles at Lan Zhou Handmade Noodles at New York Food Court. The truly adventurous will want to find their way to the basement of Golden Shopping Mall. This dingy, poorly lit maze of stalls boasts some of the best Flushing has to offer, including lamb-green-squash dumplings at Tianjin Dumpling House (where the owner of Dumpling Galaxy perfected her recipe). 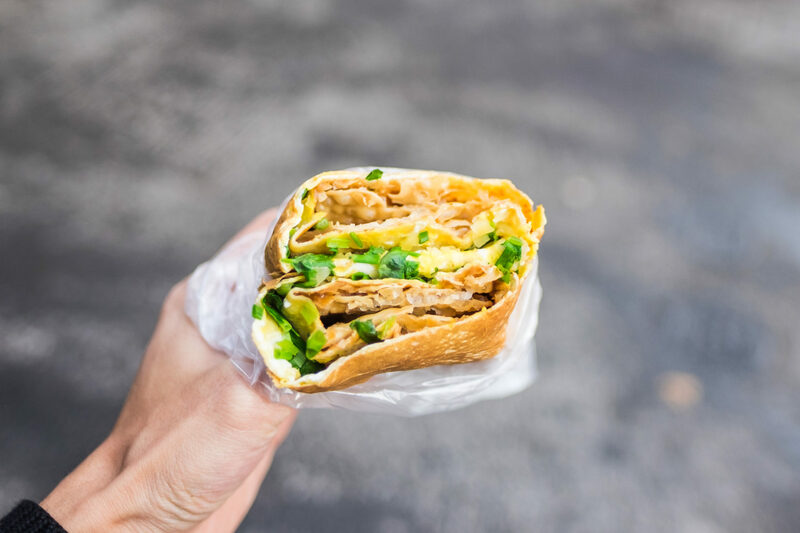 You can also sample the popular, tasty Hong Kong breakfast snack called jianbing at Express Tea Shop. Head upstairs at New World Mall to explore Jmart, an expansive Asian grocery store — you can pick up everything from hard-to-find sweet treats, like green tea Kit-Kats, to inexpensive housewares. Don’t forget to explore these other foodie highlights around the neighborhood. 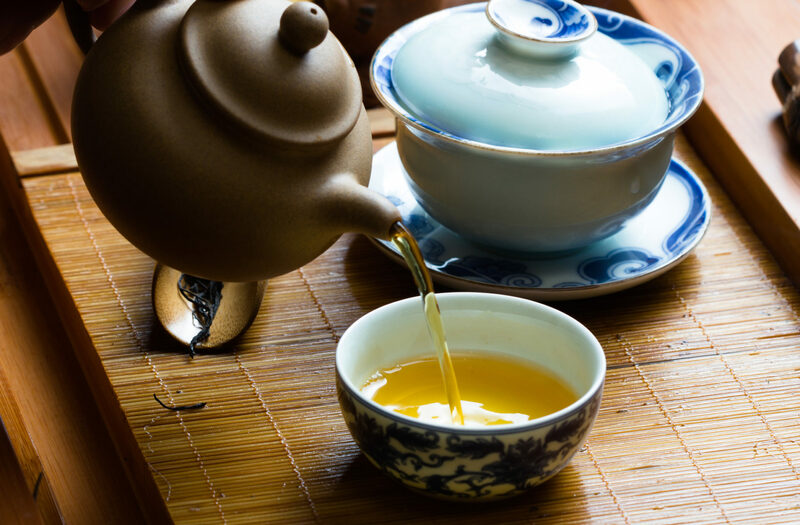 Fang Gourmet Tea: Discover a touch of elegance at the tea ceremonies here, and then head to the nearby Asian Night Market, which boasts plenty of food vendors, live music on Saturday nights and a beer garden. Baseball: No trip to Flushing is complete without taking in a Mets game at nearby Citi Field. Danish brewer Mikkeller recently opened a tasting room adjacent to the stadium, and the ballpark offers plenty of culinary delights of its own. Room for dessert? Be sure to pick up a Portuguese egg custard at local favorite New Flushing Bakery, or a bubble tea from CoCo Fresh Tea. Both are conveniently located right above the 7 Line train entrance. While you’re in Flushing, the New York Hall of Science boasts a rocket-themed mini golf course. It’s a great kid-friendly stop that’s as fun as it is educational.